Reading and share top 5 famous quotes and sayings about Coetzee by famous authors and people. 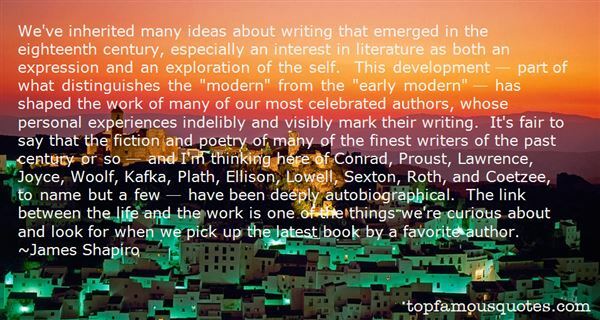 Browse top 5 famous quotes and sayings about Coetzee by most favorite authors. 1. "I found 'The Twin' sitting on a coffee table at a writers' colony in 2009. It carried praise from J.M. Coetzee. That seemed ample justification for using it to avoid my own writing. I finished it - weeping - a day later, and I've been puzzling over its powerful hold on me ever since." 2. 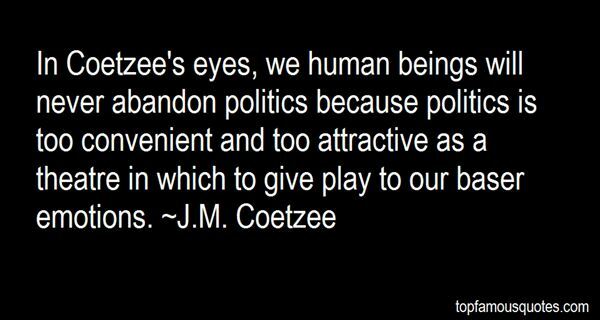 "In Coetzee's eyes, we human beings will never abandon politics because politics is too convenient and too attractive as a theatre in which to give play to our baser emotions." 3. "We've inherited many ideas about writing that emerged in the eighteenth century, especially an interest in literature as both an expression and an exploration of the self. This development ? part of what distinguishes the "modern" from the "early modern" ? has shaped the work of many of our most celebrated authors, whose personal experiences indelibly and visibly mark their writing. It's fair to say that the fiction and poetry of many of the finest writers of the past century or so ? and I'm thinking here of Conrad, Proust, Lawrence, Joyce, Woolf, Kafka, Plath, Ellison, Lowell, Sexton, Roth, and Coetzee, to name but a few ? have been deeply autobiographical. The link between the life and the work is one of the things we're curious about and look for when we pick up the latest book by a favorite author." 4. "Read non-fiction. History, biology, entomology, mineralogy, paleontology. Get a bodyguard and do fieldwork. Find your inner fish. Don't publish too soon. Not before you have read Thomas Mann in any case. Learn by copying, sentence by sentence some of the masters. Copy Coetzee's or Sebald's sentences and see what happens to your story. 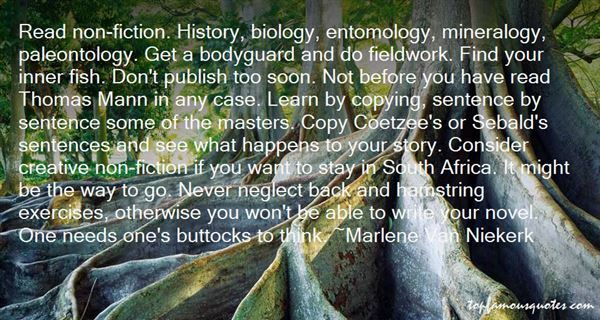 Consider creative non-fiction if you want to stay in South Africa. It might be the way to go. Never neglect back and hamstring exercises, otherwise you won't be able to write your novel. One needs one's buttocks to think." 5. "[T]hese three days of meditation have revealed to me that every thought I think is, in one way or another, an ugly, fatuous form of self-congratulation. Even what appears to be the most searing self-criticism is in fact self-congratulation. A man capable of seeing his worst side, you congratulate yourself. Coetzee is pleased to have been so hard on himself." While I do agree in part, you cannot say the same with Michael and Elvis--as their careers had seen decline and they had not died at the height of their careers and had been around for years-Elvis had been doing his thing for 20+ years, and Michael 40+ years. And death can immortalize someone, but we have to have a reason to music but Tupac gave music more than reason."